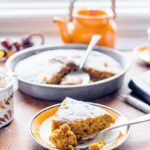 Vegan Pumpkin Cake is the ultimate fall comfort dessert! It’s moist and spiced! 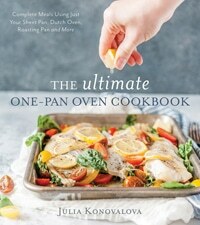 Perfect with a cup of coffee or tea for breakfast or afternoon snack. Enjoy this cozy dessert and you won’t miss any butter or eggs in this recipe. It’s so easy, you only need one bowl and one spoon to make this cake. This post contains amazon affiliate links which means if you make a purchase after following one of those links, I will receive a small commission. 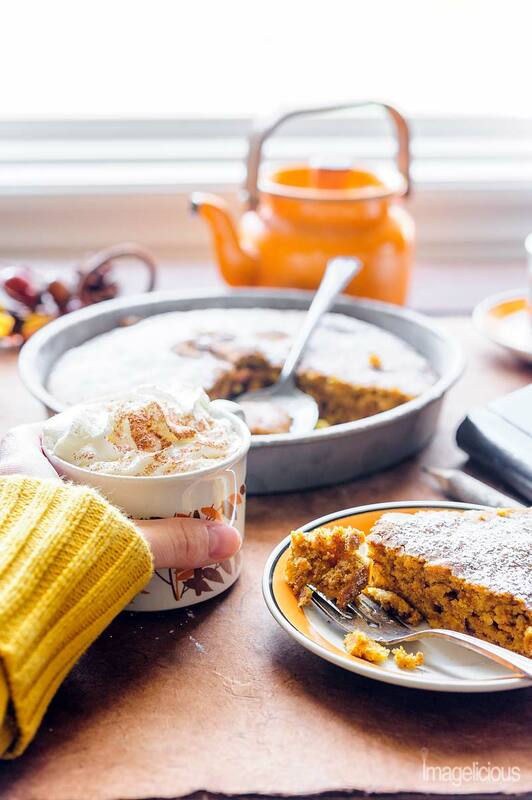 Vegan Pumpkin Cake smells like autumn with its damp fallen leaves and rain puddles. It reminds me of cozy evenings in front of the fireplace wrapped in a big blanket with a good book. The cake tastes like cinnamon and cloves and ginger and nutmeg, like your favourite coffee shop where you hide from the rain. It makes me remember those storybook moments that never happened and long for whispers from my childhood. It’s still warm outside but I can already smell the autumn wind in the air. 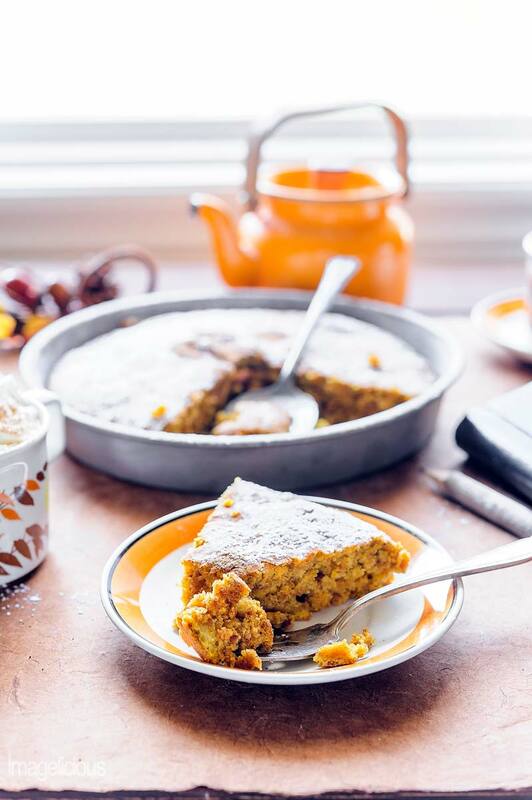 And I can’t wait to make this Vegan Pumpkin Cake again and again once the leaves start turning orange. I love making vegan cakes, yet I am not vegan. I like the simplicity of the batter. I like the ease of preparation. I like the full, vibrant flavour and delicious texture. I discovered vegan baking a few years ago. It was one cake and I made it a few dozen times. After I got comfortable with that recipe I started experimenting. Can I reduce the amount of oil and still have the cake soft and moist? Can I reduce sugar? Can I add water, orange juice, fruit, peanut butter? I’ve made so many different versions of these vegan cakes over the years and I have so many more ideas. 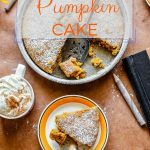 Why use pumpkin purée in a cake? 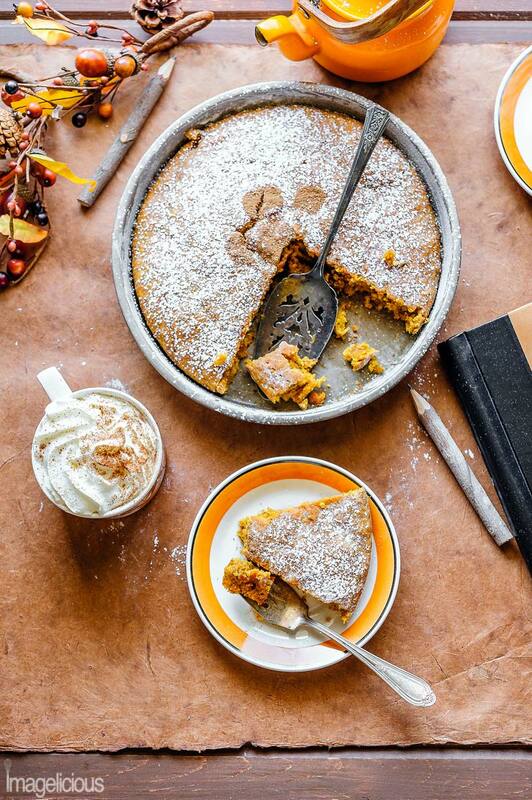 This Vegan Pumpkin Cake is sweet and spiced. 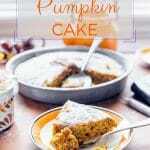 You can’t taste the pumpkin much, I use it mostly to make the cake moist instead of eggs, buttermilk, and oil. There’s still oil in the cake but very little. Like most of my vegan cakes this one is really easy to make, just mix all the ingredients and bake. Technically you are supposed to mix all the wet ingredients in one bowl and dry in the other before combining them but I like mixing everything together at once. Only one bowl to clean and one spoon to wash. NOTE: Make sure to NOT over mix the batter. Once everything is in a bowl, mix just until the flour disappears. Do not try to mix everything until smooth. Over mixing will result in tough cake. I use canned pumpkin as it’s so much easier than making your own but if you prefer then you can definitely use homemade pumpkin puree. If you do decide to use canned pumpkin like me and now you are stuck with an almost full can of pumpkin in your fridge then I have you covered! 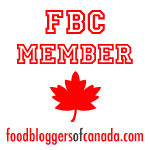 and, of course, for the super indulgent treat, you must make my Pumpkin Cranberry Fudge! And to round up pumpkin flavoured breakfast treats you should also try Vegan and Gluten-Free Pumpkin Spice Cupcakes from The Fit Cookie (I know, technically cupcakes shouldn’t be eaten for breakfast but who could resist? ), Spelt Pumpkin Waffles from My Wife Can Cook, Pumpkin Smoothie Bowl from Mid-Life Croissant, and the best way to finish breakfast Pumpkin Spice Latte from Champagne Tastes made with real pumpkin. In a large bowl combine pumpkin puree, brown sugar, oil, and water. Mix well until smooth. Add flour, baking powder, salt, pumpkin spice and mix just until flour disappears. Make sure to NOT over mix. Mix only just until flour disappears. Over mixing will result in tough cake. Bake for 50-55 minutes or until a toothpick inserted in the middle of the cake comes out clean. 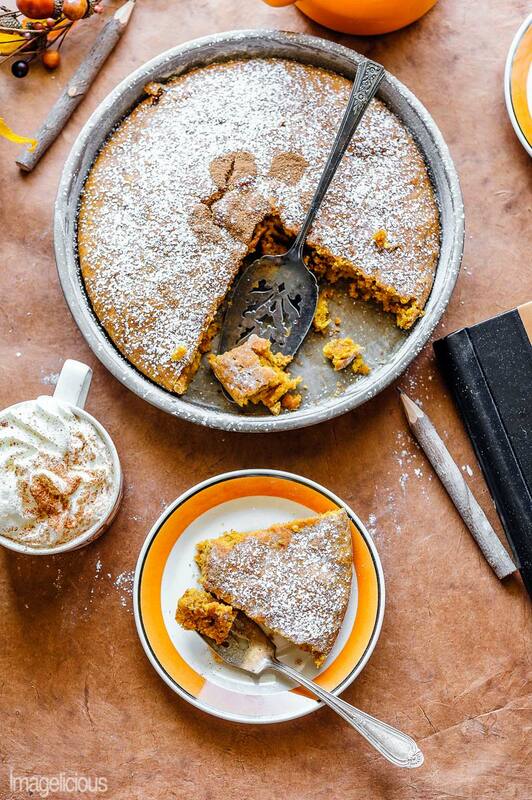 This cake is spiced but not a lot, for more intense pumpkin spice flavour add another teaspoon of pumpkin spices. The cake wasn’t fluffy and quite dense. Thoughts? Did you follow the recipe exactly or make any substitutions? If no substitutions were made then my guess would be that you over-mixed it. You really need to barely mix just until the flour disappears. Mixing for longer makes it tough. Thanks for your comment. Sorry you had issues with the cake batter. I updated the instructions based on your comments and added notes to make sure to not overmix. Think this would taste ok using whole wheat flour?